My dd and my youngest niece have both fallen under the enchantment spell cast by One Direction - a boy band from the UK. This means that I can actually singalong to all of their songs (talk about earworms) and that I'm also looking at how to help my dd turn her bedroom into a One Direction haven! Come along with me if you want some tips on creating the perfect One Direction bedroom that will have your tween or teen swooning as they walk over the threshold. Luckily for me there's this not so little site called ebay which has come to the rescue as a great source of One Direction memorabillia, even a door sign! Having a door sign on your child's bedroom door is something that they usually love when they're younger. Tweens and Teens usually feel that door signs are too childish, however I'm sure a One Direction door sign will be very much appreciated. Hopefully the ebay seller has a lot of the personalized One Direction door signs available as they do look awesome. There are sometimes door signs which just depict one of the band at a time, but these seem to disappear from ebay quickly so if you see one with your child's favorite band member snap it up quickly! 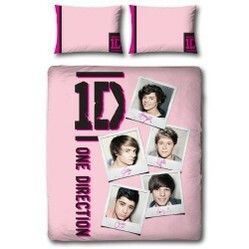 Now at the time of writing this I've only seen one bedding set with One Direction on it and it's pink which is a color that my dd has very recently said is too girly, however when she saw this set all she worried about was that it was One Direction and any color was fine! There seems to be two different types of One Direction bedding sets available now, the pink one that you can see pictured in the introduction and one that is called Crush which is now available on Amazon which is great as up to now I've only been able to find their bedding on ebay. I have always recommended to people that they keep their child's bed in a white color or natural wood just so that it's easy to match with licensed bedding as they discover and fall in love with different things throughout their childhood. It's also a great idea to keep walls and flooring fairly neutral too. One way to really embrace your child's latest favorite thing is by using posters. There are lots of One Direction posters to choose from and there are also lots of ways of displaying them. At the moment my daughter has 'grown out' of her last fad so she's taken down the framed posters that I had on her wall and has plastered her walls with posters (from magazines) stuck up with blu tack - including three One Direction ones. This brings back memories as I'm sure plenty parents used the same methods in their rooms growing up. Another idea that I've employed for a few years is to get a couple of nice frames and frame a couple of posters to hang on the wall. This really frames the posters and makes them seem more like artwork. The third idea I've used is to get a poster block mounted to hang on the wall. I did this with a Black Eyed Peas poster, but if I had more than one child or my child changed their minds on favorite bands, stars etc quite often this would get too expensive. If you're looking for some One Direction posters I've compiled a great selection here for you from the whole band on a poster to posters of your favorite band members. As well as posters providing wall detail in a One Direction bedroom you can also use wall art stickers. 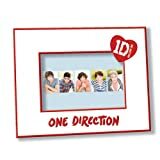 Wall art stickers are a very hot accessory for rooms that are being used more and more and there's a great selection available for One Direction fans to choose from. As I've only been able to source these stickers through ebay the selection is constantly changing, but I've seen ones that just say One Direction, ones that show an image of the boys, ones that say Keep Calm & Listen to One Direction along with stickers that say 'You don't know you're beautiful' from one of their hit songs. I've put a clock in my daughter's bedroom from the time that she could get out of bed and walk into our bedroom so I'm always looking at incorporating a clock into the bedroom decor and there are some great One Direction clocks available on ebay. You can also now find some One Direction clocks on Amazon which is awesome, although stocks seem to be running out quickly. These clocks are not only great to incorporate into a Directioner's bedroom they also make a great gift idea for Christmas, birthdays etc. The first clock I've featured for you is a wall clock with one of their early images on it (one that I know my 11 year old would love as she loves Louis in his striped shirt!). It takes AA batteries so if it's for a gift remember to include these as well. Next I've included a couple of alarm clocks (always handy to have an alarm clock in a teen's room if you want them to get up for school! You can get an analogue double bell alarm clock or a digital alarm clock whichever they're more used to. With limited supplies available online you sometimes have to add the wow factor by being a little creative. There's very little other things that I can find to decorate the room, however I have found a selection of One Direction dolls available. Now my daughter is not into playing with dolls any more, but she loves the idea of having One Direction dolls so a simple solution is to buy shadow boxes to put onto the wall or sit on shelves. Measure the shadow boxes first and make sure that they are big enough that you can stand one of the dolls up in them (affix the feet with blu tack if the doll doesn't stand very well). You can choose to get their favorite One Direction member as a doll or get all five and incorporate them into the room. There seems to be two different sized One Direction doll on the market - the Barbie sized dolls and some mini dolls. Harry, Niall, Louis, Liam & Zayn. Each come with their own personally styled fashion outfits. Collect all 5 members of the band. Another way to incorporate One Direction into the bedroom is with a photo frame. If your daughter is anything like mine she loves having photos in her room whether it's friends, grandparents or dogs (never any of her parents I note!). There's actually an official One Direction frame which I'm sure they'd love to pop their favorite photo in. Looking For More Bedroom Decor Ideas for Your Daughter? Everything is so expensive. I'm 14 and I have to ask my mom to buy anything. I hope I'll get this stuff for the next upcoming Christmas.